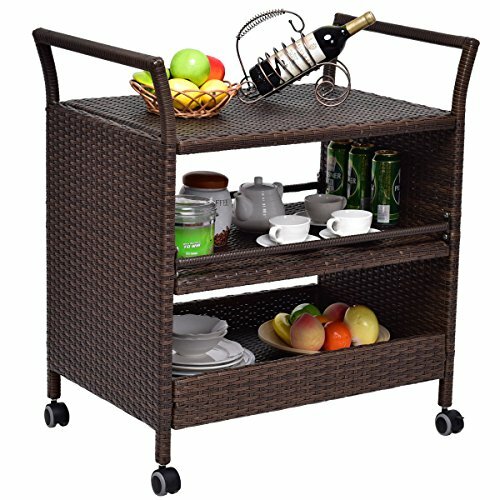 This our Tangkula outdoor patio portable wicker serving cart constructed by strong powder coated steel frame and weather-resistant wicker, equipped with three shelves for ample storage, ideal for display of different kinds of fruits, plates or drinks, 4 smooth-rolling wheels for easily and conveniently rolled around, two side handles, making the push more convenient. Don't hesitate to add it to your cart now! 【Sturdy & Weather-Resistant】Our Tangkula outdoor patio wicker serving cart constructed by strong powder coated steel frame and weather-resistant PE rattan with waterproof function, features durable and stylish. And two side handles, making the push more convenient. 【Plenty of Storage Space】This serving cart comes with three shelves for ample storage, ideal for display of different kinds of appetizers, fruits, plates and other drinks. Hierarchical design offers large storage space and enhances the service efficiency of the restaurant. 【360 Degree Swivel Wheels】Our portable rolling wicker bar cart equipped with 4 smooth-rolling wheels, makes this unit can be easily and conveniently rolled around the kitchen, restaurant or other place. Especially, you can move the unit around with ease and lock it into place with its 2 lockable casters. 【Easy to Assemble & Maintain】All of the hardware for assembly and instructions are included in the package and it is easy to put together with instruction. And all weather-resistant rattan allows you can wipe dirty stain easily from the surface. 【Customer Service & Guarantee】If there is any questions please feel free to contact with us, our experienced customer service team will response in 24 hours. We packed this set as good as we can, if there is any part missing or damaged during shipping, please contact us first and offer us pictures of damaged part, we will solve the problem as the way you want(replacement at no charge or discount).